Do you or someone you know have a new baby? If so, then you know how expensive formula can be. Right now, you can get some FREE Baby Product Samples, Gifts and Mailed Coupons from Enfamil! 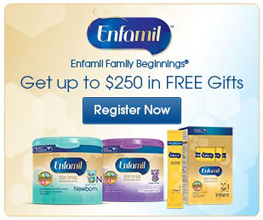 Click HERE to sign up.Get up to $250 in FREE Gifts Enfamil Family Beginnings. You’ll get trusted advice for every stage of your baby’s development, plus discounts on Enfamil products, free samples and special surprises. Enjoy!